... and then they'll be back in the gouging business. I'm really hoping they allow us to purchase gems or gem items with our tokens, even if outrageously overpriced. It might cost Pogo in the beginning, but if tokens are not going to be replenished, we'll run out soon enough and then they'll be back in the gouging business. That would be nice! What would you consider outrageously overpriced? 10 million / 10 gems? Yeah. That would keep a bunch of players from being able to use tokens, especially newer players. Maybe they'll have another way to use tokens, like maybe in game purchases for power ups for less tokens, maybe. It will be interesting to see what they actually come up with. I personally do not use tokens on anything. I don't use them on anything either. What's left to spend them on? Pogo expressions? Club Pogo Members, get ready to run! The Pogofest Badge Marathon is almost here, with a new route that takes you through ten Pogo favorites. If you can make it to the finish line in time, you'll win a bonus completion Badge. The marathon starts this Saturday, so get your stretches in. It's a long run! Yes, the marathon ends on September 28th. Claire Hart 2: Secret in the Shadows Badge Marathon starts on October 3rd. Pogo_Spike will be gifting all Club members 5 free challenge badges. If we complete them by October 9th, we'll win a bonus badge. Lots of marathons and lots of gifts. Tx, Pogo! I have to admit, as annoyed as I get with EA/Pogo, I really do love that they have been gifting us so many badge. I love challenges! After this one, I don't see any more badge challenges - just game updates. Which of course will have new badges. 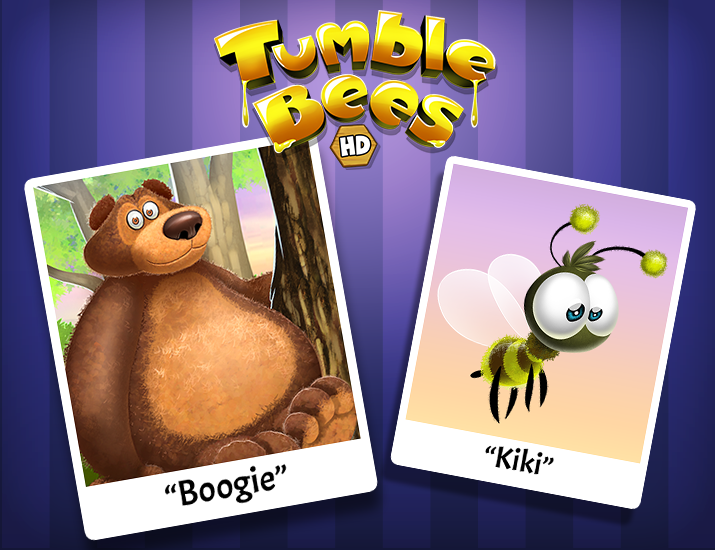 Here's a sneak peek at the Tumble Bees HD characters, Boogie Bear and Kiki. Jewel Academy - New levels slated for October. Poppit! HD - September 27th. Tumble Bees HD - Slated for October 9th. Lottso Express HD - Slated for late October. Tri-Peaks Solitaire HD - Slated for late October. Mahjong Safari HD - Slated for December. First Class Solitaire HD - Slated for December. ** With Claire Hart Classic, all of the episodes that you have purchased in the Flash version of Claire Hart: Soul Searcher will be owned by you in Claire Hart Classic. More details will be released at a later date. - Mini Mall update : next scheduled release in the Mini Mall will combine some Fall and Halloween Minis on October 4th. - Poppit! Party t-shirt will be out on September 27th along with a free animated Poppit background. - Some super-cute Lottso Express HD Minis coming out in October. Club Pogo Members, a new Badge Marathon is headed your way. Keep your eyes peeled, because we'll be gifting you a new Personal Marathon Album loaded with five Claire Hart: Secret in the Shadows Challenges to take on. If you finish them before time runs out, you'll win a bonus Badge! What happened to the Solitaire Gardens update for Nov?